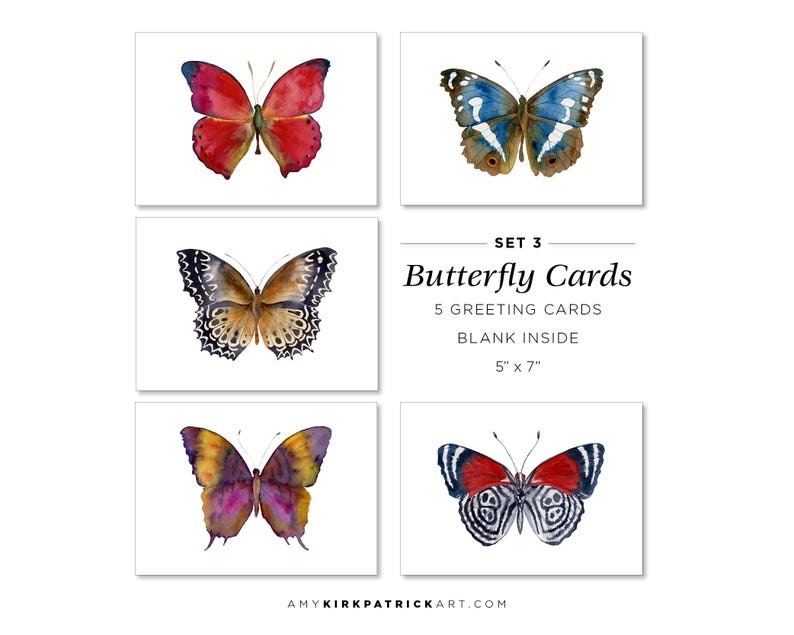 SET #3 • Set of five 5x7 greeting cards featuring five different butterfly watercolor paintings by Amy Kirkpatrick. Free domestic U.S. shipping! Printed on bright white, smooth matte, acid-free cardstock that is easy to write on. Blank inside. White envelopes included have a nice, quality weight to them. notecards did the trick! Quick delivery as well. Gorgeous! This is a beautiful addition to my collection - thank you! Beautiful print, excellent packaging. Perfect condition. PayPal, Etsy Gift Cards, or Direct Pay with credit cards are accepted. Your 100% satisfaction is guaranteed. If for some reason the item is not what you expected, simply return it to me in the same packaging for a refund. Shipping is not refunded. Please feel free to contact me if you have questions or concerns about your order. My shipping preference is USPS. Most prints are shipped flat and you will receive a tracking number. Larger prints are shipped in a sturdy mailing tube. Orders are usually shipped within 48 hours. Orders made Fridays or weekends will ship the following Monday or Tuesday. ORIGINALS are mailed with insurance and will require a signature upon receipt. CANCELLATIONS: You may ask me for a cancellation anytime and if it hasn't already shipped, I will cancel your order for you. Depending on your country, some additional duties and taxes may be required to receive your item. For example, the United Kingdom royal postal service states "You no longer have to pay customs duty for goods up to the value of £135, however you will still be required to pay import VAT and excise duty where applicable." I am always available to discuss special orders. I also offer a wide variety of framing options, canvas or acrylic prints, home decor items and apparel. Drop me a line for more information. Listing descriptions should answer any size questions, but please feel free to ask. Most items are made to order, so if you need a size adjusted or want to change the orientation. Simply let me know in the Note to Seller or ask me. Prints are made with archival inks and papers and should be safe from fading for up to 200 years and are steamy bathroom safe. 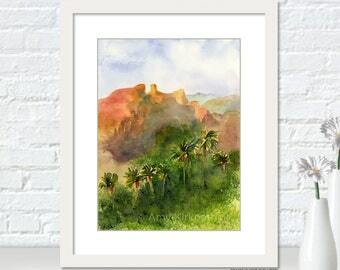 Originals should be framed with glass or acrylic and are best kept out of direct sunlight. It is okay to hang an original in a steamy bathroom as long as it is well-framed and protected with glass or acrylic. All prints are sent in clear archival sleeves and include a title sticker for the back of your frame. Unframed prints are available for wholesale direct through me, but I also have a source for wholesale framed or canvas prints. Contact me for more information.